Some states find themselves in the crosshairs of disaster far more than others. U.S. presidents have declared nearly 2,000 major disasters in the 50 states and the District of Columbia over the past 60 years as of April 2013, but just 10 states have been responsible for a third of those. See if you live in one of these disaster-prone states -- and if you do, you may want to review your insurance policies. The Show-Me State has had disastrous weather in every month of the year: severe snow and ice storms in winter, tornadoes during the spring, summer and fall, and flooding at virtually any time. Arkansas has been walloped by heavy rain, snow, ice, tornadoes and flooding over the years and has even taken poundings from tropical storm systems, though it's not a coastal state. In 2008, storms and tornadoes associated with Hurricane Gustav littered streets with debris, damaged buildings, roads and bridges, and knocked out electric cooperatives. The disaster roster in Kentucky has included landslides, mudslides and rockslides, along with flooding and tornadoes. The state was ripped up in 2008 by the remnants of Hurricane Ike. Another major disaster declaration involved a record snowfall in late 2004, and yet another stemmed from a 1981 series of chemical explosions in Louisville sewers. This Gulf Coast state has been battered by hurricanes, including Isaac in 2012, Gustav in 2008, Katrina and Dennis in 2005, and Ivan in 2004. 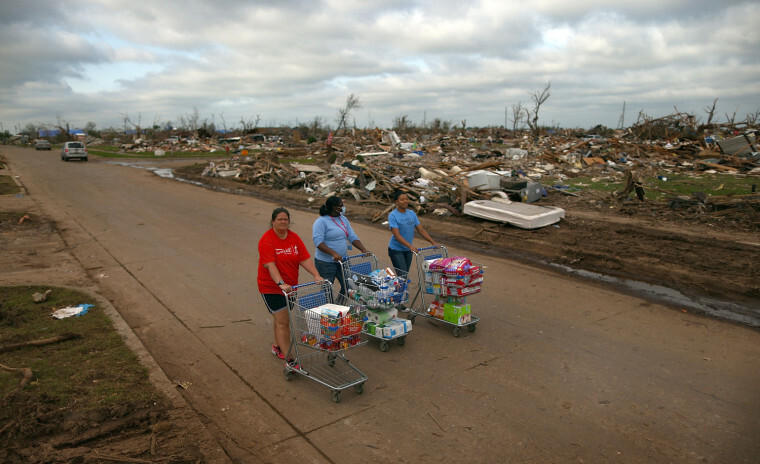 But tornadoes in April 2011 rivaled the hurricanes for destructive power, lashing the state with winds that exceeded 210 mph and leaving about 250 people dead and an estimated $1.5 billion in damage. It has taken Louisiana years to recover from Hurricane Katrina, the now-legendary 2005 storm that government officials say killed nearly 1,000 residents and caused tens of billions of dollars in damage. The Gulf state has been visited by numerous hurricanes including 1969's Camille, a Category 5 storm that came ashore with 190 mph winds. The Sunshine State has been pummeled by dozens of tropical storm systems since the 1950s -- none worse than Hurricane Andrew in 1992. The Category 5 hurricane with gusts of more than 200 mph held the title as the most expensive natural disaster in U.S. history until Hurricane Katrina in 2005. Severe freezes have been disastrous for Florida farming on multiple occasions. Across its empire that stretches from the Great Lakes to the Atlantic coast, New York has been lashed at by blizzards and tropical storms. In 2012, Superstorm Sandy killed nearly 50 in the state and caused more than $40 billion in damage. New York also received disaster declarations for the Sept. 11, 2001, terrorist attacks that destroyed the World Trade Center and an earlier bombing in the complex's garage. The recent monster tornado that blasted through the Oklahoma City suburbs is only the latest devastating storm to hit a state that recorded an average of 55 twisters per year since 1950. The worst tornado in recent history struck near Oklahoma City in May 1999 with unprecedented winds in excess of 300 mph that killed 36 people. Oklahoma also has endured severe winter storms, wildfires, floods and the 1995 terrorist bombing that killed 168 people at the Oklahoma City federal building. The nation's most populous state also is one of the most disaster-prone due to wildfires, landslides, flooding, winter storms, severe freeze and even tsunami waves. But earthquakes are the disaster perhaps most closely associated with California. The worst in recent years have included a magnitude-6.9 quake near San Francisco in 1989 that killed 63 and a magnitude-6.7 quake in Southern California in 1994 that killed 61. Within the Lone Star State's nearly 267,000 square miles (second only to Alaska in size), at least one major disaster is declared nearly every calendar year. Texas has dealt with tornadoes, floods, wildfires and regular coastal hurricanes. One of the deadliest and costliest in recent decades was Hurricane Celia, which tore up Corpus Christi in 1970. The storm left 13 dead and destroyed millions of dollars' worth of property.